A Strip-close dragon is lending a festive feel to The Forum Shops. The Strip-close wonder lending a festive feel to The Forum Shops through "the celebratory Chinese New Year season." YOU DON'T HAVE TOO LOOK HARD... to find year-round examples of spectacle in Sin City. If we go back -- way back -- you can start with the distant mountains and vast sky and all of those red rocks, natural features that lend the pizzazz-iest place on the planet even more pizzazz (if such a thing could be possible). Mondo LED signs along the Strip, old-school blinky bulbs lining casinos still wearing their '60s-style snazz, and over-the-top shows up the spectacle factor further. But Las Vegas has a way of going the dazzling distance come the start of the new year, when decorations for the Chinese New Year pop up. From beautiful mums lining the entrances to various hotels to the sparkly dragon at The Forum Shops at Caesars Palace to Bellagio's garden-glittery paean to the occasion, the Year of the Red Monkey is arriving in Las Vegas in some astounding ways. 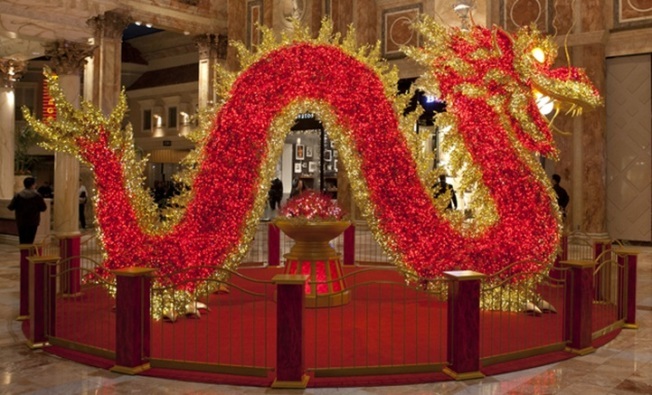 THE FORUM SHOPS AT CAESARS PALACE... once again welcome back a red-and-gold dragon display that's some "22-ft. long, 6-ft. wide, and 12-ft. high." Those are some impressive measurements, numbers that truly lend a presence to this fantastical creature. As with so many things in Sin City, some of the wow factor springs from the numbers: "(T)he massive 950-lb. steel-framed dragon is covered in 30,000 red and amber LED lights, many of which flicker, giving the mythical beast a vibrant look and dynamic feel." So, how long will the dragon call upon the Strip? Admire it through the Chinese New Year season. BELLAGIO CONSERVATORY & BOTANICAL GARDENS: The special Chinese New Year wonderland debuted inside the resort on Friday, Jan. 8. The final day? March 12. As always, this plant-filled paradise is free to see, and very thematic to the holiday. Don't be surprised to find a floral monkey at play somewhere, as well as over-sized gold coins made of natural materials. Incense, water elements, and other peaceful touches are yearly symbols of the Bellagio's garden-pretty presentation.